Revised And Corrected To The Present Time By John Dower, F.R.G.S. John Dower, 1866. Publisher: London G.W Bacon & Co. 337 Strand WC. Not recorded in Hyde, but would be No. 73, between states (6) and (7). This map originates from a large scale map of London compiled and engraved by Edward Weller F.R.G.S., issued in parts as supplements to the Weekly Dispatch newspaper during 1861 and 1862. The map consisted of nine sheets on a scale of 9⅜" to 1 Statute mile. This map predates Edward Stanford's Library Map of London (Hyde No. 91) produced for the 1862 International Exhibition, and Weller's map is on a much larger scale than Stanford's 6" to 1 mile Library map. The map was extremely popular with the map buying public, being reprinted numerous times, and as a result was included in the Dispatch Atlas published in early 1863. 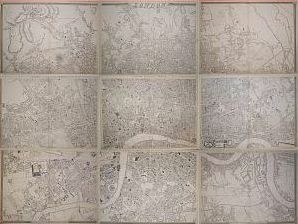 The plates for Weller's London map were purchased by Cassell, Petter & Galpin in mid 1863, and the map was immediately printed for sale by them. A copy of this printing is included in the MAPCO collection. Cassell declared that their "large map of London, as well as being the largest, is universally admitted to be the best map of London ever produced". 'A new and special survey' of London was commissioned by Cassell to update the map for publication in 1866. The work was undertaken by John Dower F.R.G.S, and resulted in a much updated and improved map that included proposed developments in London as well as the new buildings, streets and railways that had already been completed. By 1868 the Weller plates with Dower's updates had been sold by Cassell, Petter & Galpin, and were in the possession of George Washington Bacon, "the American map publisher". Bacon had been declared bankrupt on 23 May 1867 while occupying premises at 49 Paternoster Row, but by January 1868 he was rebuilding his business at 337 Strand, premises he was sharing with one William Tweedie, also a mapmaker and publisher. It was while he was at 337 Strand that Bacon first published his copy of the Weller map (displayed above). It is important to realise that Bacon overlaid many of the new London developments over the top of the Weller and Dower plates. Some of the London features shown on the map were speculative in nature, representing known planned developments or information published in Parliamentary Papers, some of which never eventuated and were not build. For more information see the 'Aids To Dating This Map' section below. By June 1869 Bacon had relocated to 127 Strand, where he built one of the most commercially successful map businesses that London has ever known. G.W. Bacon & Co. flourished throughout the Victorian era, and Bacon remained associated with the business until his death at his home, Woodlawn, Bacon Hill, Hindhead, Surrey, on 21 January 1922. LONDON in 1870. - BACON'S GREAT MAP of LONDON, six by eight feet. Largest and best published. Showing 22,000 streets. Price, in case or on rollers, £2 2s. Reduced editions from 12s 6d. - G.W. Bacon's map depot, 127, Strand, 20 doors west of Somerset-house. There is little doubt that historians, genealogists and family historians will find this highly detailed map of London a useful street finding aid, especially for use with the 1871 Census of London. The map was purchased by Alfred John Owen on a trip to England from Australia around 1880. Upon Alfred's death the map passed to his daughter Lyzette Owen, and it remained in possession of the Owen family of Victoria, Australia, from the 1880s until 2007, when it was purchased by MAPCO for display on the MAPCO : Map And Plan Collection Online website. There is much life recorded on the surface of this map, as the ink splashes at the bottom of the map testify. The map has been a working map at some point in its long history, having been pinned up for display for a significant period of time at some stage. The map has suffered considerable yellowing due to exposure to natural light, so it must have been on display for many years. It was hung on a wall with a window to the right of the map, as the yellowing of the map is far more extensive to the right hand side than to the left. While it was on display many items were pinned over top of the map, resulting in uneven patchwork discolouration to the paper upon which the map is printed. Drawing pin holes and marks from the pin heads are evident over much of the surface of the map, and one can only speculate what the map may have been used for, and what was pinned upon its surface. Perhaps it was used for planning of London engineering works such as sewer extensions by the London Metropolitan Board of Works, or railway extensions by one of the many railway companies operating in the Metropolis? Perhaps it was simply displayed because it is an attractive item, or because it reminded someone of home? It is intriguing to speculate about what this map may have been used for in its working like. The paper sections of this map have been individually hand coloured prior to the map being mounted onto linen. In 1871 Bacon issued updated images of the large scale Weekly Dispatch map in his Illustrated Complete Atlas, as well as publishing it under the title "Bacon's Library Map of London and Suburbs" (Hyde No. 165). Individual map sheets could also be purchased, presumably hand-coloured to suit specific customer requirements. It seems likely that Bacon would have had a number of workers involved in hand colouring the individual sheets, so variations in colouring and accuracy to detail would be expected. It now seems likely that Bacon was issuing the Weekly Dispatch map as individual sheets as early as 1868 from his premises at 337 Strand. Variations in attention to detail and hand colouring and are evident in the map displayed here, and the individual sections certainly suggest different hands at work on the hand colouring process. A few examples of this variation are evident in the coloured north section and uncoloured south section of Victoria Park (the south-west corner is completely uncoloured), and in the coloured north section and uncoloured south section of the St John's Wood railway line. There are many other examples of this inconsistency throughout the map. This map was previously thought to have not been published by Bacon until 1871, so it has been important to date this copy as accurately as possible. There are many features shown on the map that aid with the dating process, not the least of which is Bacon's address at 337 Strand, where he is known to have been resident from at least January 1868 until April 1869, possibly longer. Dating was carried out by identification and interpretation of the following London developments shown on the map. It is important to recognise that Bacon overlaid many of these features on top of the Weller and Dower plates, and that some of the features shown were speculative in nature, representing known planned developments or information published in Parliamentary Papers, some of which never eventuated and were not build. G.W. Bacon & Co. address at 48 Paternoster-Row on 23 May 1867. Bacon declared bankrupt on 23 May 1867, after which he vacated these premises. Great Northern Railway's Edgware, Highgate & Finchley branch opened 22 August 1867. Albert Hall construction commenced 20 May 1867. Note that the Albert Hall was originally called the Central Hall of Arts & Sciences, but Queen Victoria changed the name during the laying of the foundation stone on 20 May 1867. It is shown on this map as the Central Hall of Arts & Sciences, indicating that Bacon did not always update every detail on his maps to reflect the ever changing state of the expanding Metropolis. Construction of Holborn Viaduct commenced. St Pancras Goods Station started to receive trains in September 1867. G.W. Bacon & Co. address at 337 Strand on 24 Jan 1868. THE LONDON GAZETTE, JANUARY 24, 1868. Patent Law Amendment Act, 1852. Office of the Commissioners of Patents for Inventions. for the invention of "improvements in apparatus for gymnastic purposes." G.W. Bacon & Co. address at 337 Strand on 27 Feb 1868. G.W. Bacon & Co. advertisement in the Birmingham Daily Post, Thursday, 27 Feb 1868. Bacon is rebuilding his business after bankruptcy, and is sharing the premises with another mapmaker, William Tweedie. Millwall Docks opened 14 March 1868. St John's Wood Railway from Baker Street to Swiss Cottage opened April 1868. Early plans record that the St John's Wood Railway was to extend to Hampstead High Street. However, this extension was never built, probably due to lack of finance. This map shows the projected railway line crossing Hampstead High Street and terminating at Lower Heath. This single detail shows that Bacon was including proposed improvements on his maps as well as works that were already under construction. Tottenham & Hampstead Junction Railway opened 21 July 1868. Midland Railway extended to St Pancras. Passenger train services switched from King's Cross to St Pancras on 1st October 1868. Note that the Metropolitan Railway goods shed at Agar Town is shown as still being serviced by a line off the Great Northern Railway rather than from the Metropolitan Railway's own direct route into St Pancras. This railway line was probably decommissioned prior to 1 October 1868, so the fact that it is shown suggests that the map pre-dates 1 October 1868. Note that the Grand Hotel is shown. Work commenced on the hotel in 1868, but it was not completed until 1876. New Central Meat Market completed December 1868. Opening of the new Smithfield Meat Market recorded in the Illustrated London News 5 December 1868. Note that railroads into the market, and a new street to the south-west, are shown as dashed lines, indicating these are either proposed works, or works commenced and yet to be completed. District Railway opened from High Street Kensington to Westminster opened Christmas Eve 1868. Metropolitan Railway extended from Paddington to Kensington. Metropolitan Railway extended to Moorgate. G.W. Bacon & Co. address at 337 Strand on 28 April 1869. G.W. Bacon & Co. address at 127 Strand on 23 June 1869. A notice dated 22 Jan 1869 in the London Gazette of 26 January 1869 records a meeting at The Flask Tavern, Hampstead. Columbia Market opened at Hoxton May 1869. Established in 1869 as a covered food market by the philanthropist Angela Burdett-Coutts, for 400 stalls. "The Opening of Columbia Market" is recorded in The Illustrated London News on 8 May 1869. Note that the map shows Columbia Square but that the ground occupied by the market building is shown empty, indicating that construction of this significant Gothic style building has not yet commenced. Interesting to note that the traders preferred to sell outdoors, so the market closed in 1886. East London Railway opened through Thames Tunnel from Wapping to New Cross. Queen Victoria Street opened from Mansion House to Cannon Street October 1869. Work completed and the street opened for public traffic in October 1869. Note that it is still shown as New Street on the map, indicating that when the map was made the street was yet to be named. New Blackfriars Bridge opened 6 November 1869. Note that the Temporary Wooden Bridge used during construction of New Blackfriars Bridge is still shown in position on this map, dating the map prior to completion of the bridge. Holborn Viaduct opened 6 November 1869. Albert Embankment opened 24 November 1869. G.W. Bacon & Co. address at 127 Strand, W.C., "twenty doors west of Somerset House". District Railway extended to Blackfriars. Victoria Embankment opened 13 July 1870. Albert Hall opened 29 March 1871. Note that this is not shown on this map. St Thomas's Hospital opened on Albert Embankment. Last mention of BACON at 48 Paternoster Row in 19th century newspapers. George Washington BACON and Francis APPERTON of No 48 Paternoster-Row, in the city of London, Booksellers, Publishers and Copartners, adjudicated bankrupts on the 23rd day of May 1867. An order of Discharge was granted by the Court of Bankruptcy, London, on the 2nd day of Aug 1867. Nivard Ovington, Maree White and Adrian Whittaker for their assistance with the dating of this map. Sincere thanks also to the 70+ people who previewed this map and offered valuable feedback prior to it being fully scanned for display. Thank you all!